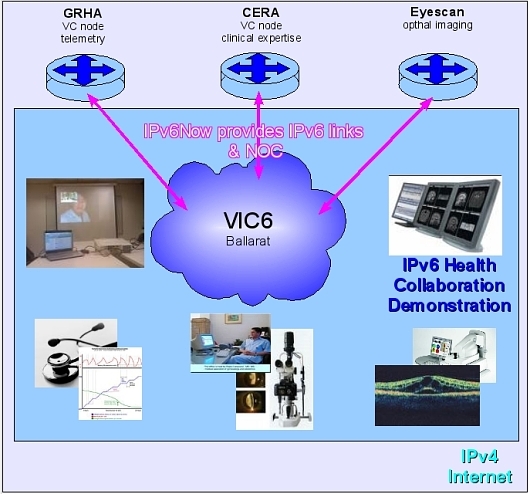 The aim of VIC6 Phase 2 was to build one or more demonstrations of IPv6 capability to support applications for the health sector. Arising from these demonstrations, sector organisations would then be in a good position to gain understanding and experience to allow smooth transition to IPv6, which will ultimately stimulate health sector innovation based upon IPv6. 1. Business Analysis: discussions with the Victorian health sector on the business parameters, issues and timelines to IPv6 adoption. 2. IPv6 Demonstration: based upon the Business Analysis, designing and carrying out relevant demonstrations of health sector applications and VIC6 network interoperability up the designed network, organising testing and carrying out demonstrations. 4. Project Review: Based upon the above, providing a written analysis on the results, the issues arising, and the potential benefits of IPv6 to the health sector. After the outreach activities of VIC6 Phase 1, Ai Group and IPv6Now were fortunate in attracting the interest of some of the most experienced and innovative organisation within the Victorian health sector for Phase 2. Key health sector participants include the Australian Healthcare Messaging Laboratory (AHML), the Centre for Health Innovation (CHI), the Centre for Eye Research Australia (CERA), Eyescan Pty Ltd, the Grampian Rural Health Alliance Network (GRAHNet), and the Medical Software Industry Association of Australia (MSIA). The first VIC6 Health Sector Working Group meeting was held on Wednesday 1 April 2009 at the Ai Group offices. Discussion continued over the following weeks in person and by email. The participants described their areas of interest in potential IPv6 demonstrations, which fell into four groups: Network architecture and operations, Standards and interoperability, Clinical services, and Innovative capability. The second VIC6 Health Sector Working Group meeting was held at the Centre for Health Innovation, Melbourne, and Greenhill Enterprise Centre, University Drive, Mount Helen, Ballarat, on 30 April 2009, with vidoconferencing between the locations. Discussion from the first workshop had suggested a number of potential demonstrations, and the focus of this workshop was to narrow down the possibilities to something achievable within the time and infrastructure constraints. The fourth VIC6 Health Sector Working Group meeting was held at the Ai Group offices, Melbourne, 22 June 2009, with teleconferencing and videoconferencing to other participants. Further planning and detailed discussion of technical aspects of the demonstration took place. The fifth VIC6 Health Sector Working Group meeting was held on 28 July 2009, via videoconferencing between the Centre for Health Innovation, the Centre for Eye Research Australia, and the Greenhill Enterprise Centre, Ballarat. Although there are still some further technical enhancements to come, we saw a significant step forward using IPv6 in the VIC6 Health Sector Demonstration. VIC6 would particularly like to express appreciation for the resources contributed by Eyescan to the VIC6 project, demonstrating how new Internet technologies can build value for the health sector. We succeeded in working with Eyescan to show an improved model of remote access to ophthalmic imaging equipment, against some substantial challenges. During the VIC6 Health Sector Demonstration, we showed in real time how we could achieve direct remote access to eye scanning and manipulation software. This remote access was achieved direct to the specific device by way of the new Internet Protocol, IPv6. We used this approach to demonstrate live access to, and remote operation of, the actual Eyescan computer during the VIC6 Health Working group meeting. As a marked difference from previous approaches, access to the machine was facilitated by using a domain name, eyescan1.tunnels.ipv6now.com.au, rather than the current arrangement that relies on an IP address and port (eg 203.123.456.789:9999). Our approach required no additional intervention from network administrators once the computer itself is configured, and did not depend on configuration of other parts of the Eyescan network. The technique was supported by IPv6 tunnels and network infrastructure provided by IPv6Now Pty Ltd.
Eyescan pioneered the concept of remote access to the results of ophthalmic scanning by allowing 'remote desktop access'. Under the VIC6 Health Demonstration project, we were able to move the Eyescan 'remote desktop' approach to the new Internet Protocol, IPv6, allowing demonstration that remote access to ophthalmic scanning results could be easily arranged between multiple remote locations. In practical terms, this means that the subjects of ophthalmic scanning (patients) and the expertise in analysis of ophthalmic scanning (clinicians) do not have to be co-located, at least for initial analysis. Subsequently, if this approach was made widely available, significant savings could be made in avoiding unneeded travel, by patients and/or clinicians, and much improved services could be provided to regional and remote locations. There is now the prospect of more thorough research into the efficiency and clinical effectiveness of remote access to ophthalmic scanning results. Jonathan Crowston of CERA has suggested that there could be the possibility of some pilot studies in this area, perhaps in collaboration with the RVEEH and the Grampian Regional Health Alliance, potentially leading to more substantial research projects. TheVIC6 Health Sector Working Group meeting on 18 August 2009 continued work on IPv6 usage. The AHML discussed its HL7 messaging protocol system, which was implemented because 'IPv4 can't be trusted'. There appeared to be great potential added value to apply HL7 with a matrix of identification using features of IPv6, particularly improved efficiency. TheVIC6 Health Sector Working Group meeting on 29 September 2009 provided a further step in IPv6 video conferencing. Tandberg systems located at Centre for Eye Research in Melbourne and the Grampians Rural Health Alliance Network in Ballarat were connected via an IPv6Now IPv6 tunnel into VIC6, to provide the simplest connection we have seen so far, but still maintaining a high level of quality to support effective videoconferencing. Phase 2, the VIC6 Health Sector and IPv6, has successfully demonstrated key operation of general purpose network implementations that support data, voice and video using IPv6 for various health applications. Several video conference demonstrations over IPv6 have been successfully completed between Grampians Rural Health Alliance Network, Ballarat and the Centre for Eye Research in Melbourne. Simpler remote access over IPv6 has been demonstrated with Eyescan, a new eye health service delivery business. The Centre for Health Innovation has been established as the first VIC6 Industry Node after enabling IPv6 on its network, as a future foundation for innovate health solutions. There is also the future prospect of more thorough research into the efficiency and clinical effectiveness of remote access to ophthalmic scanning results via IPv6. CERA has suggested pilot studies in this area, perhaps in collaboration with the Royal Victorian Eye and Ear Hospital (RVEEH) and GRAHNet, potentially leading to more substantial research projects. Further work is planned between IPv6Now and the Australian Health Messaging Laboratory to demonstrate operation of the HL7 health messaging standard using IPv6 over VIC6.